Zombies have never been hotter than they are now with movies like 28 Days, Zombieland and TV shows like AMC’s Walking Dead attracting huge audiences. Sears looks well set for a healthy retail business post-Zombie Apocalypse. They’re not playing sides here though, the retailer is providing the everyday goods that help meet the needs of both the Zombies and the Humans alike. 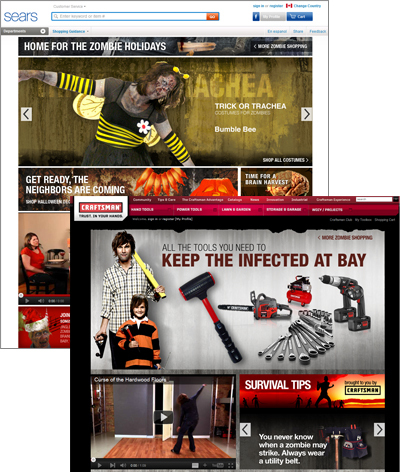 Humans (for now) can find specials on Craftsman chainsaws and all the tools you need to help keep the infected at bay, or even a new lawnmower to help your lawn look alive. Short on supplies? Sears can help replenish your essential household rations, and you can avoid the hordes of the undead roaming the streets by taking advantage of home delivery. Maybe you should pick up a bicycle helmet (or brain guards) or a powerful new shop vacuum ideal for removing those messy zombie remains. Zombies haven’t been left out, the recently undead can ‘Find Their Undead Style’ with special Zombie makeovers like the one embedded above. There are blenders, which are ideal for brain smoothies or shop for Steamers and prepare a healthy Steamed Brain with Tartar Sauce and fingers Provencal. Delicious! There are patio sets to die for… again. Having trouble on the site? With a quick click you can chat with a Zombie sales rep for tips like “zazzah graghrah” and “gragh rabbah mrh”. The depth of the content here is impressive, and Sears has done a brave job to incorporate the idea of zombies into their website maintaining the fun and silliness of Halloween dress-up without being too offensive. World Population Set to Hit 7 Billion on October 31 – What Number Are You? Since 1968, the population of the world has doubled, and according to estimates from the United Nations Population Fund, the world’s population is estimated to be hit the 7 billion mark on Monday, October 31. 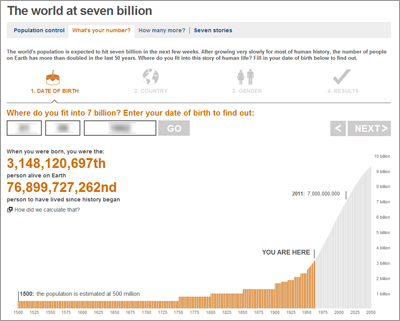 Seven billion is a massive number, but it’s tough too visualize just where your life fits into that number. The BBC has created a ‘What’s Your Number?‘, cool interactive application that will estimate just where you fit into that population number. Enter your birth date into the application and you can see how what the earth’s population was on the date you were born (for example, I’m number 3,148,120, 697), as well how many people had lived on earth since history began (78,899,727,262 people had lived before me). The application also shows you the current population of your country and it’s population growth; Canada for example has a population of 34,135,152 growing at 1% per year. Every hour there are 42 births, 28 deaths and as a Canadian male I have a life expectancy of 78.2 years. For more information visit the UN Population Fund’s detailed population calculator . The numbers (which of course are estimates) are calculated based on UN Population figures and estimates of growth over time. The second number of how many people have lived on earth since history began is based on UN calculations using the methodology of scholar Carl Haub, who had estimated how many people had been alive since 50,000 BC. Monday is Halloween, and in addition to the usual vampires and ghosts coming to your door you’re bound to come face-to-face with the odd Lady GaGa, Captain America, Jack Sparrow and god forbid, maybe even a Charlie Sheen or two. You can even add Progressive Insurance’s popular spokesperson and insurance-store cashier Flo to that list of possible trick or treaters as well. The insurance company has created ‘Dress Like Flo‘, a helpful instructional page with tips on choosing clothes, hair and makeup preparation tips for all the Flo wannabes. A downloadable nametag, logo and button will complete the look. If you don’t feel like creating your own costume, you can find the ‘official’ Flo costume on Amazon. 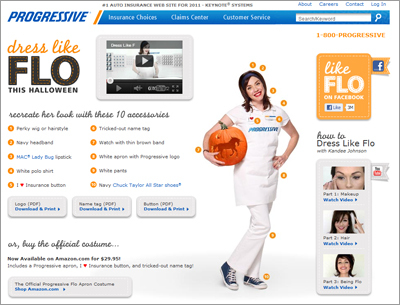 Flo was created back in 2008 by ad agency Arnold Worldwide, and is played by actress and comedian Stephanie Courtney. The perky Flo even has her own very popular Facebook page with over 3 million ‘likes’. What other advertising icons do you expect to see out-and-about this Halloween? STIHL Brand Campaign from Whybin TBWA on Vimeo. As we in the north of North America begin to feel the cool days of fall creeping into our area, the folks in Australia are celebrating spring. Now I`m no expert on the Australian climate, but from a quick glance it appears winter would be considered `sweater-weather`here. 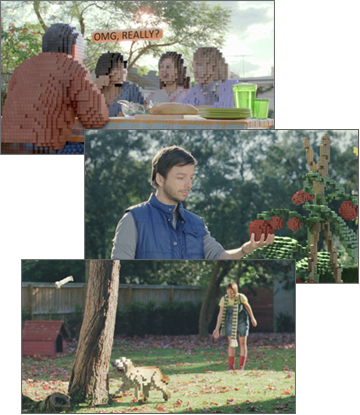 Either way, it`s the early days of spring and Stihl, manufacturer of chainsaws, hedge trimmers and other yard maintenance tools is launching a new campaign with a cool-looking 60-second TV spot (embedded above). The ad promotes the idea of families spending more time outside in their backyards, and less time sitting inside watching television and messing around on computers (which oddly I am doing as I write this). It makes this point by showing `pixelated` one dimensional versions of a dog chasing a stick, a man watering his vegetable garden, even friends sitting at a picnic table speaking to each other as if they are texting. 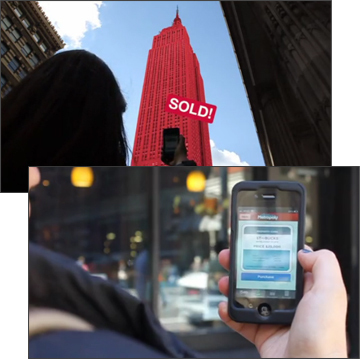 The pixels begin to break away and the commercial ends with the message – Get Real. Get Outside. The creative comes from WhybinTBWATequila with production by Good Oil Films, the cool special effects were created by Fin Effects & Design. Panasonic’s new Blue-ray Disc Recorder can store up to 28 days of HD content. To demonstrate the storage capabilities, ad agency The Campaign Palace will be filming 26 year old Australian Rommy Gulla with hidden cameras as they annoy him with pranks and challenges for 28 days. The results will be posted on the Panasonic Australia’s Facebook page, where fans can win weekly prizes for sharing and answering questions about the videos. Fans who want to be more ‘hand-on’ can get involved by submitting their suggestions on ways to annoy Rommy. Those suggestions will be promoted or demoted by the other Facebook fans. But it’s not all fun and games, there’s a bit of controversy brewing about whether Rommy Gulla is a real person or an actor specifically hired for the role. In these days of 200 channels of reality TV, it’s not unthinkable that someone would put themselves out there in a campaign like this for a little cash and fame. However, a bit more transparency this case would be welcome and I don’t think it would hurt the campaign whatsoever. I’ve also read a few comments that express concern that the campaign will promote ‘bullying’, and with that being a hot button topic right now Panasonic may be walking a fine line here. The title of the campaign ‘The Persecution of Rommy Gulla’ alone is concerning, as is the awarding of prizes to others who join in as ‘persecutors’ (their words not mine, check out the rules). The campaign begins Monday, what do you think? 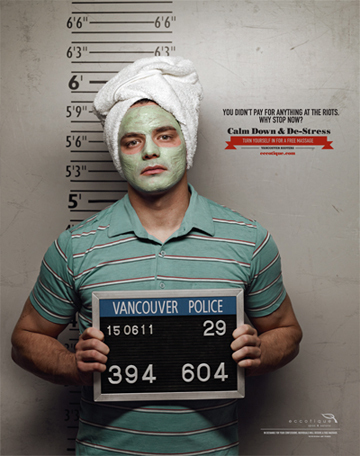 Does the theme of this campaign concern you, or are we becoming too politically correct and overly cautious? This video, highlighting 100 styles of dance and fashion has been released to promote the opening of the ginormous new Westfield Stratford City shopping centre in East London. 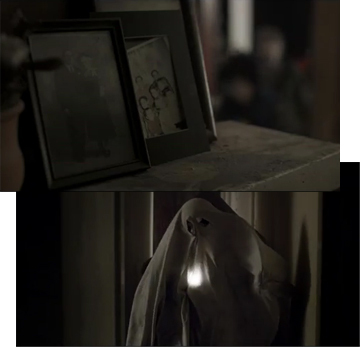 It features 60 costume changes (6 for each decade) and took more than four days to shoot. The video was produced by London agency The Viral Factory was directed by Jake Hunt with music arranged by Oscar nominee Tristin Norwell. 2011 is the 50th anniversary of the company that got it’s start in the very early days of Silicon Valley as a supplier of computer tapes. Back during my younger days in the 70s I knew Memorex best as one of the leading brands of audio cassettes. It was also known by it’s signature ad tagline “Is it Live, or it it Memorex?”. Times have changed and now Memorex is part of Imation specializing in flash memory and other electronics. Turning 50 is a awesome excuse to throw an party, and there’s few better party folk to invite than the colourful Yo Gabba Gabba gang, including Brobee, Foofa, Muno, Toodee, Plex and of course DJ Lance Rock. 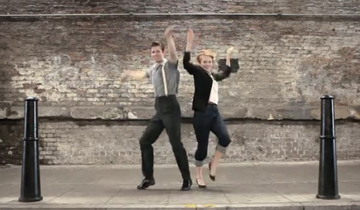 Throughout the summer hundreds of fans participated in Memorex’s Dancey Dance video contest on Facebook uploadin. The winning family of the contest and 16 lucky bloggers (ooooooh so jealous) Have been invited to join the party as well. Don’t miss the party live on UStream next Friday at noon Central time for presents, cake and of course ‘dancey dancing’. 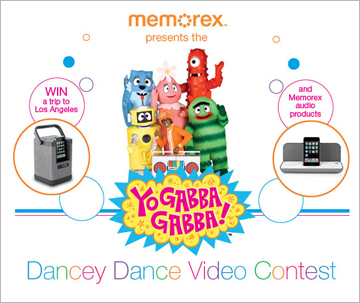 Filed Under: Digital Culture, Music Tagged With: Memorex, ustream, Yo Gabba Gabba!